Painting Mixed Media on Board | 24" x 24"
Every time one throw away toys, boxes, wood or metal, they perceive it be useless but for me they are a treasure, an opportunity. I paint with great passion and I love creating stories with all that I make. My unique mixed media work tells stories of passion, strength, love, of sense and senselessness, of opaqueness and transparency of the past, present and future of days gone by and days in contemplation and the days beyond and of perennial hope. For me art is presenting this very humanness of our existence, acknowledging the vulnerable side of us. 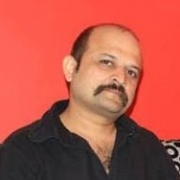 Vivek Rao is a sculptor, painter and an assemblage artist. He uses any recyclable material as the surface for his paintings or as a material for his sculpting. Being an eco-awareness driver, he wishes to remind people of the importance of recycling.